Hamilton identifies 1973 to 1996 as "the age of OPEC" and 1997 to the present as "a new industrial age." During 1974�96 growth in non-OPEC oil production Granger causes growth in OPEC oil production. OPEC oil production decreases significantlywith positive shocks to non-OPEC oil production in the earlier period, but does not do so in the "newindustrial age". Inthe "newindustrial age" OPEC oil production rises significantlywith an increase in oil prices, unlike during "the age of OPEC" period. OPEC oil production responds significantly to positive innovations in global GDP throughout. Over 1997:Q1�12:Q4 the negative effect on real oil price of positive shocks to non-OPEC oil production is larger in absolute value than that of positive shocks to OPEC oil production. The cumulative effects of structural shocks to non-OPEC oil production and to real oil price on OPEC oil production are large. The cumulative effects of structural shocks to OPEC production and real oil price on non-OPEC production are small. Results are robust to changes in model specification. 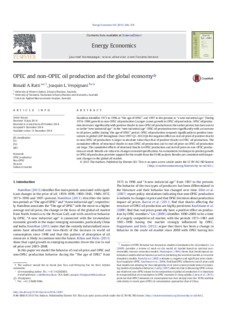 An econometric technique to predict growth inOPEC oil production provides support for the results fromthe SVAR analysis. Results are consistentwith important changes in the global oil market.